A fountain pen is only as good as the paper with which it's used, and if you've ever used one with run-of-the-mill looseleaf, you know exactly what I mean. 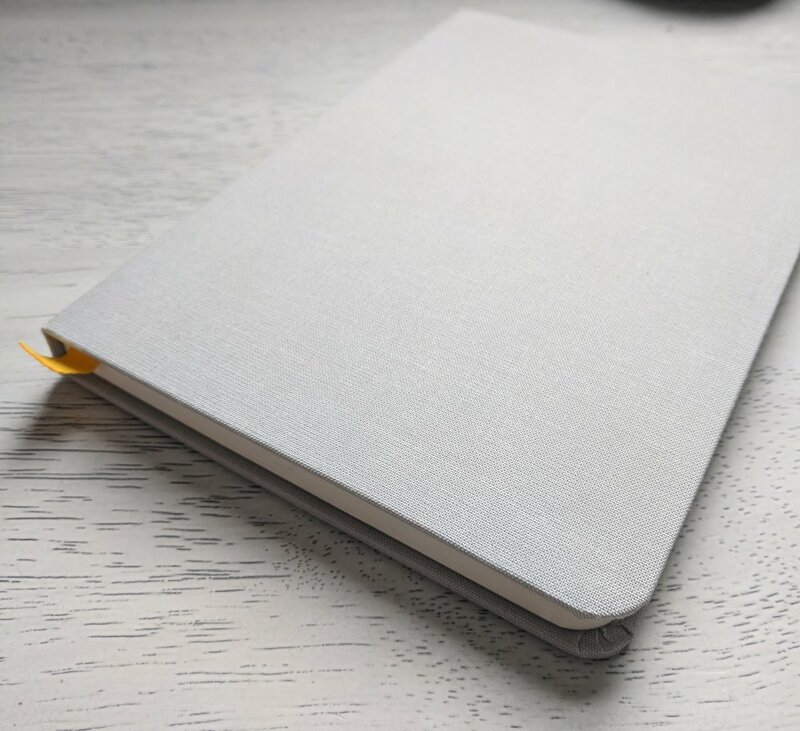 The Baron Fig Confidant is one of the most well known premium notebooks on the market, and it's likely because its performance matches the name. The notebook is well designed and functions beautifully as a primary notebook, in many situations. Its paper comes in several types, but I always choose the dot grid design, which is a nice compromise between blank and lined pages. The dots are a subtle gray and fade away when not in use, figuratively that is. I should note that my primary notebook for the last year has been an A5 Leuchtturm1917 hardcover, so this is what I'll use for comparison. At first glance, the Baron Fig Confidant Flagship is a stunner. The linen hardcover has a great feel, and I much prefer it to the Leuchtturm1917's cover. Speaking of covers, Leuchtturm overs a ton of different color cover options. Although Baron Fig recently expanded its color offerings, they are not nearly as extensive as the colors available for the Leuchtturm1917. Although the color options for the Confidant are limited, I love the light grey cover and yellow bookmark combination. It really is a fantastic looking notebook. I've carried the Confidant around in my bag for weeks now, and it has also held up pretty well. I notice that the Confidant also has a slightly thicker cover than the Leuchtturm1917, making it a bit sturdier. The Confidant comes with a single fabric bookmark, which makes me miss the two-bookmark design of the Leuchtturm1917 notebook. That said, the Confidant's bookmark is wider and feels less flimsy overall. Another aspect of the Leuchtturm1917 that I miss immediately is the elastic band that holds the notebook closed. This feature is relatively common, and its omission in the Confidant is an unfortunate one. I tend to throw my notebook in my bag, and the elastic band ensures that it won't come open, spilling any business cards that I've stuck inside or damaging the interior paper on other objects in the bag. This is made somewhat worse by the fact that the Confidant doesn't have an interior pocket either. Sometimes I like to carry a notebook on its own, and it's helpful to have a little pocket or elastic band to hold bits and bobs in place. I have to admit, I don't really get the whole lay-flat design with the Confidant. For those unfamiliar, Baron Fig claims that its notebooks are designed to lay flat on a a flat surface. That's great in theory, and they do, but it's not necessarily a novel concept. The Leuchtturm1917 lays flat too, and I don't see any difference between the two notebooks. Ooooh, everybody loves some good quantitative research. Confidant (left) and Leuchtturm1917 (right). In my brief (and very unscientific) test of the Confidant's fountain pen performance, it performed moderately well, but not nearly as well as the Leuchtturm1917. I notice more feathering (spreading out of ink) with juicer nibs on the Confidant, but this would be less of an issue with finer nibs. When comparing the Baron Fig Confidant with the Leuchtturm1917, the Confidant dries faster, but the 1917 has less feathering. I also experienced a bleed-through issue with the Confidant and juicier nibs, which is sort of a deal breaker for me, since I always use both sides of a page and rely on my TWSBI 580 as a daily driver. The ink is also more vibrant on the Leuchtturm1917 page when it dries. Don't believe me? Take a look below. Leuchtturm1917 in back (top) and Confidant in front (bottom). Notice the feathering in the Confidant? It may seem like I dislike the Confidant from some of my comments, but that's not the case at all. This is a killer desk notebook for non fountain pen users. I could see myself buying the larger version to keep next to my computer or as a commonplace book, but it doesn't really fit my needs as a traveling companion. I'd love to be able to keep a few business cards tucked away in it, but there are no pockets nor an elastic band to hold things in place. If you carry your notebook in a backpack or bag pocket by itself, this probably won't be much of an issue, but it just doesn't work well in my bag full of random office supplies and teaching materials. For now, I'll stick with the Leuchtturm1917 as my notebook on the go, but the Baron Fig Confidant is still a solid performer that's worth a look. Ah Japan, the land of shrines, kindness, and obsessive high quality. Japan feels like a second home to me. I spent six months working there as an intern and take a group of students back every year to get a taste of what it’s like to live there. A visit to a Japan stationery store a few years ago sparked my interest in everything analog, which resulted in this blog, and the Midori Traveler’s Notebook is one of my favorite Japanese stationery discoveries. 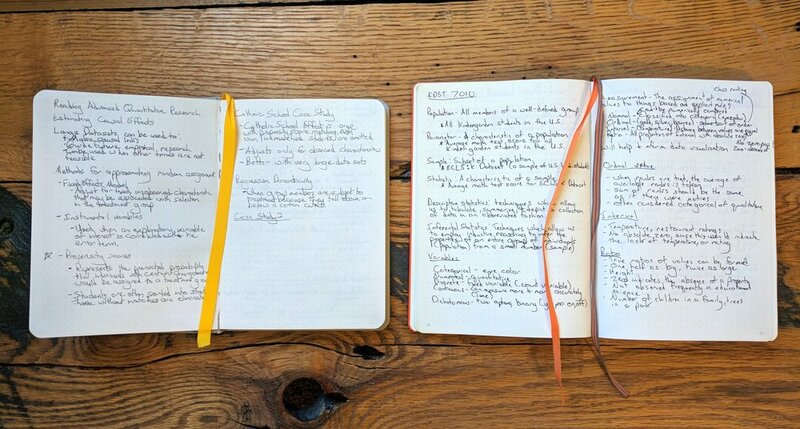 While I published a high level review of the Midori Traveler's notebook months ago, it’s hard to completely review a product that’s so customizable. The Traveler’s notebook can be whatever you want it to be, so it took some time to figure out where it fit in my analog workflow. Now that I’ve been able to break my Midori in, I wanted to revisit it and review it for the purpose for which I’ve found it most useful, travel. If you're looking for a basic overview of the Midori Traveler's notebook, check out my original review. Although I love the Leuchtterm1917, which is my everyday carry notebook, it’s not quite up to snuff as an all-inclusive traveling companion. It doesn’t fit in my travel bag, nor does it hold the things that I typically take with me during a business trip, like business cards and railway maps. This is where the Midori Traveler’s Notebook shines. Check out the screen shots below to see how the Midori insert size compares to the Leuchtterm 1917 A5. I bet you’ll never guess my favorite thing about the Midori as a traveling companion. Go ahead, I’ll wait… Its battery doesn’t die. There’s something magical about cell phones in that their batteries seem to magically drain twice as fast on-the-go. I typically save a digital version of the Japanese train and subway maps on my phone, but they’re completely useless if my phone dies. I still keep a digital map handy, but I also tuck a subway and JR map into the back pocket of my Midori’s artisanal storage folder (artisanal in the sense that I made it out of a Manila folder and some tape). I always forget to bring business cards on business trips, so I slide a few business cards into the business card slot of the custom folder, and there’s no longer a need to freak out when I leave my card case in my other pants. I added the Midori zipper bag to my notebook during my trip to Japan, and it’s the perfect place to tuck away business receipts that I’ll need for reimbursement later. Instead of cramming receipts in pants pockets and bags, they’re in one place which makes it so much easier to sort through them later. Patrick Ng’s Chronodex is one of my favorite planning tools, and it turns out that it’s a perfect tool for travel too. Remember that terrible cellphone battery? I copy my trip itinerary into the corresponding days of the Chronodex, so that I have a backup. All of the occupied time is filled in with black lines, and I fill in the free time with red lines. This gives me an idea of how much free time I have during the day. In the office, I might use this time to do some writing or answer emails, depending on how big the time chunk is (more on time chunking some other day). In Japan, I use this process to see when I might be able to sneak away to go see an old friend or visit a favorite restaurant. If you read my writing regularly then you know of my fountain pen affinity. Although I love my Lamy 2000 and Pilot Vanishing Point, they don’t travel with me. I’ve read all sorts of stuff about how easy it is to fly with fountain pens with careful planning, but I just don’t need that level of uncertainty when I fly. Traveling is stressful enough without having to worry about a pen leaking all over there place. Instead, I carry the Fisher Bullet Space which rests comfortably in the Midori Traveler’s Notebook pen loop. The Space Pen is rugged and pressurized, so it could write in an underwater war zone, but it works well for brainstorming on the plane and business meetings too. It’s worth noting that the Space Pen is a bit small for the large pen loop, so make sure to buy the optional Space Pen clip or go the small pen loop, if you’re an avid Fisher fan. You're right, this isn't a picture of a Space Pen. I discovered this little J. Herbin beauty while traveling, and am putting it through its paces. The Midori is an all-in-one powerhouse. Although I no longer carry it in my work bag on a daily basis, I think that I’ve found the perfect use for it. Instead of tossing random bits of paper and business cards into my man-bag (yes it’s normal for men to wear bags in Japan), the Midori Traveler’s notebook keeps everything safely tucked away and organized. I use the full-size Midori Traveler’s Notebook, but there’s a passport-size Traveler’s Notebook too, which is more of a pocket companion. The Midori Traveler’s Notebook is a best-in-class product. Aside from its excellent performance, its leather cover serves as a record of the many journeys and adventures of its owner. With dozens of accessories and inserts, it can be highly customized to fit the needs of its user. An example of some of the available inserts. Want to learn more about the Midori? Check out the Midori section of the Penventory. "Why do these kind of things always happen to me?" I stared at the hole in the front grill of my new car. Someone backed into it with their trailer hitch, cracked the grill all the way down the middle and drove away. No note and no apologies. There are a few things wrong with the "woe is me" attitude into which I eagerly slipped. To begin with, it was based in pure fantasy. "These things" never happened to me. In the course of my 12 years of driving experience, this was only the second time that my car had been damaged. Aside from the delusion, this negative attitude also made things worse. 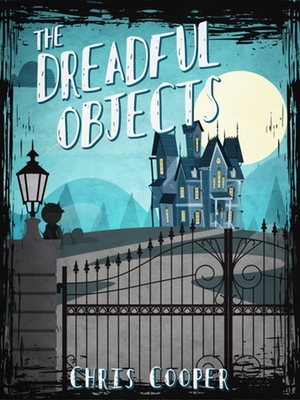 Instead of getting over the incident and moving on, I agonized over it, surveilled the neighborhood for suspects, and lost sleep worrying about a repeat offense. My interpretation of this tiny little incident cost a week or two of mental capital and anguish, anguish which turned out to be much worse than the event itself. What would have happened if I approached the event with gratitude? It sounds anti-intuitive and a bit insane, but let's take a closer look. Although a hit-and-run is less than ideal, someone with a gracious mindset might focus on the fact that they have insurance, while the offender may not have been able to afford it or the bump in rates that come along with causing damage. If I had a gracious mindset , I would have been thankful that it only cost a tiny fraction of the actual damage amount to repair. I paid $250 to repair $1,000 worth of damage. Aside from repairing the damage, the body shop also detailed my dreadfully filthy car. The $250 was worth it just for the cleaning. The human mind is much better at noticing the negative events over the positive ones. Remember all of those times that someone didn't cut you off on the road? What about all of those times when your flight left on time? We notice the missed deadlines, perceived slights, and unfair treatment, but we easily forget the 99% of the times when things go as planned. We forget how lucky we are to have flights to take and cars to drive. Reveling in the negatives is a hard habit to overcome, but overcoming this bad habit can dramatically increase happiness. Had I focused on the positives in my situation, I would have saved a week of agonizing over my first world problem, and I would have been happier as a result. This is all great, but how can someone develop a mindset of gratitude? Journaling is one way. I've tried various forms of journaling and often turn to journals when the times get tough. Despite knowing the benefits of journaling, I've never been able to make it stick, meaning the relief is only temporary. I found my solution to the journaling problem in The Five Minute Journal. The concept is simple and revolves around establishing a habit of gratitude. Each page of the journal represents one day, and there are approximately 200 days worth of pages. I start each day by listing three things that I'm grateful for, three things that would make today a great day, and a daily affirmation. In the evenings, I wrap up the day by listing three awesome things that happened during the day and a way that I could have made the day better. The key is to complete the morning half as soon as possible upon waking up and the evening half as close as possible to bedtime. This leads to starting and ending the day with feelings of gratitude, and this regular practice is a powerful way to develop the habit. Nope, this picture isn't underexposed. The night portions of the page are shaded grey. I've often gone to bed worrying about a work problem or started the day grumpy about the weather. The Five Minute Journal journaling process flips the script. After a week or so of the process, I started to expect to feel gratitude first thing in the morning and prior to bed, which affected my emotions before I even filled out the day's page. Instead of fixating on the bad, my brain started to fixate on the good. It sounds silly, but it really works. 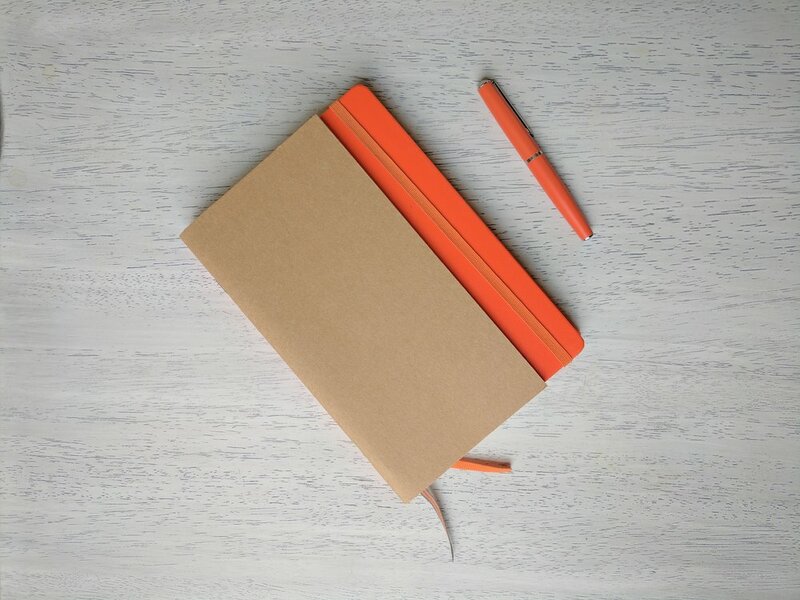 I started The Five Minute Journal process with a simple text file and blank notebook, and I found it beneficial enough of a process to buy the official product. The official version is certianly pricier than a text file, but spending a little cash up front reinforces the need to stick to the habit, for me at least. I hate wasting money on things that I don't use. The journal itself is very well made, with embossed lettering on the front and a woven hardback cover. It starts with a complete primer on how to use the daily pages and provides substantial background on its design process and intended use. The paper is thick and fountain pen friendly. From start to finish, The Five Minute Journal's little design choices here and there make it a joy to use. 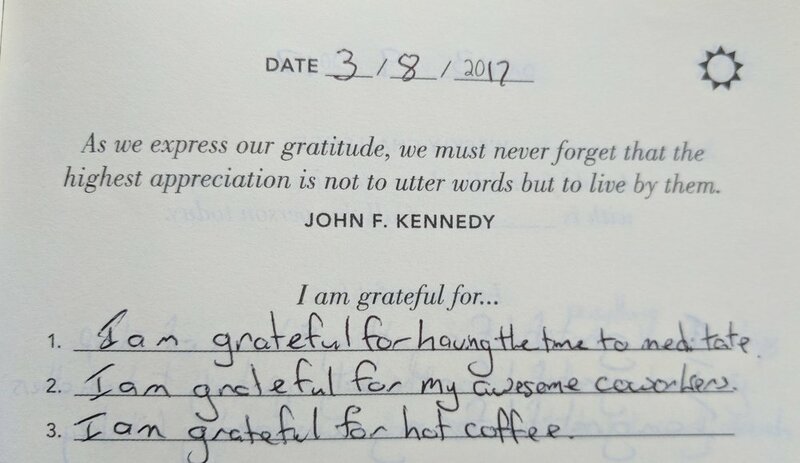 Each daily page comes complete with an inspiration quote, and there's even a weekly challenge to amp up your gratitude game. These challenges range from simple thankyou writing to making small donations to favorite charities. The Five Minute Journal is an excellent tool for developing a habit of gratitude, which leads to a happier life. The positive results of using the journal were immediate for me, but I really noticed a mental shift after my first month. For those who aren't quite ready to drop $20 for the official version, start with a plain notebook or text file. If that works for you, consider the fancier version. Regardless of what you use, incorporating a journaling practice into your daily life can have major positive benefits. I begged my parents for a Mead Composition Book. "What about a spiral notebook? We have a dozen in the closet." My mom clearly didn't understand the severity of the issue. Harriet the Spy didn't write in one of those dime-store spiral notebooks, the ones that they stack up in huge pallets during the Back to School sales at Walmart. She wrote in a Mead Composition Book. Sure, they were a dollar or two, but you can't put a price on keeping the neighborhood safe, or surveilling strategic targets. My relationship with composition books lasted for several years. I covered each book with a homemade label that said "Private" and filled several books with journal entries, observations, and other personal notes. This was more than a school notebook; it was my companion - an integral part of my daily adventures. It's been nearly two decades since I felt this fondly for notebooks, which rapidly became cheap commodities in my life. I reached for the cheapest spiral notebooks that I could find during my college years and would often leave them half empty. This changed when I discovered fountain pens, which required higher quality paper. The Midori Traveler's Notebook became my goto, but its skinny pages, while perfect for travel, were just too small for daily use. I loved the appearance of Moleskines, but their elegance was only surface deep. Moleskines stink with fountain pens. The search for a similar form factor brought me to the Leuchtturm1917. Leuchtturm1917 notebooks come in a range of sizes, colors and rulings. I chose the 249-page orange A5 size with dotted pages. The notebook's hard cover is reminiscent of a Moleskine's cover. 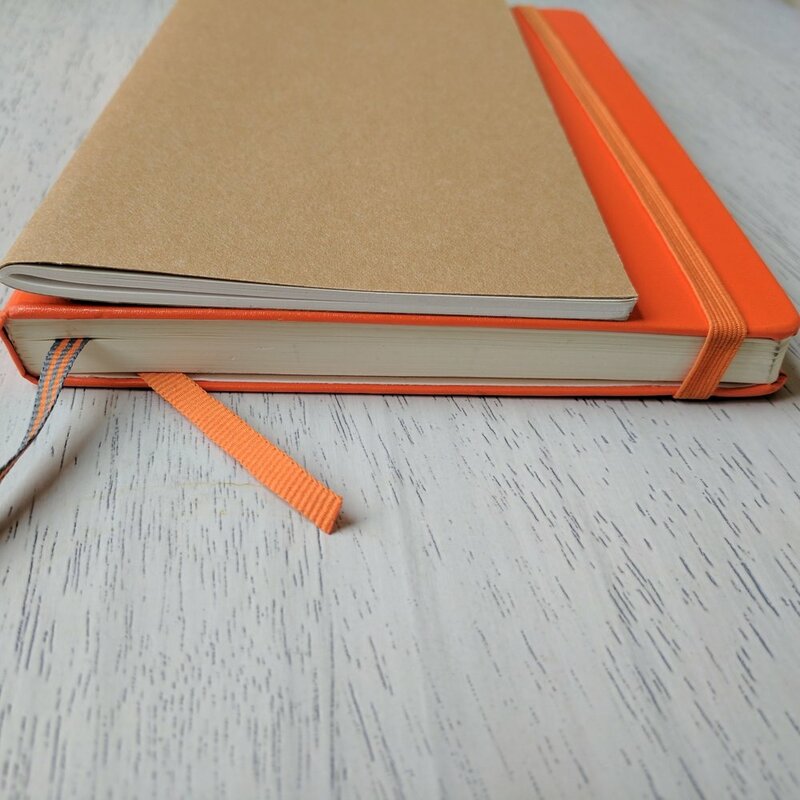 Theres an elastic band that wraps around the notebook, to keep it closed. The band seems sturdy enough to stand up to regular wear and tear, and I've carried my notebook loose in a messenger bag for several months, with no damage to the elastic band. The interior of the Leuchtturm1917 boasts some useful features. 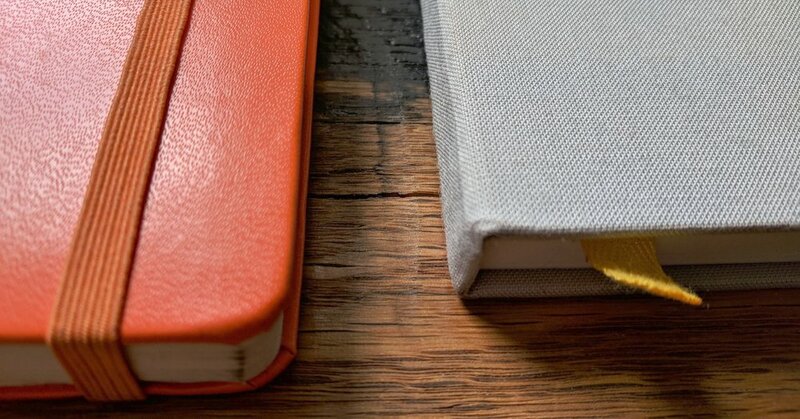 The notebook has two bookmark ribbons, with color accents that match the color of the notebook. I can keep a few business and index cards in the built in pocket of the notebook, which runs the length and width of the back cover. The pocket is made from sturdy card-stock and accordions out, to reveal its content. The pocket isn't going to hold dozens of papers, but it's useful for holding a few odds and ends. The notebook also includes archival stickers for the spine and covers, so that you can keep track of exactly what's inside your notebook. My Leuchtturm1917 lives in my messenger bag and accompanies me to daily meetings and events. The notebook lays flat on a table, without creasing or weighing down the pages. This was a pleasant surprise, moving from the Midori Traveler's Notebook, which flips shut without weights and doesn't sit flat on the table. I prefer to use the Leuchtturm1917 on a table, but it also works well in my lap, due to the support of the hard cover. The small touches and thoughtful design of the Leuchtturm1917 make it a delight to use, but these flourishes are pointless without high-quality paper. Fortunately, the notebook delivers, with an 80 g/sqm paper that really shines with fountain pen ink. The juicy-fine nib of my Lamy 2000 leaves a lot of ink on the page, but there's never visible bleed through on the other side of the page. The dot pattern is subtle, but provides much needed guidance for writing and sketching. I feel the same way using the Leuchtturm1917 as I did when I used a Mead Composition Book during my childhood. 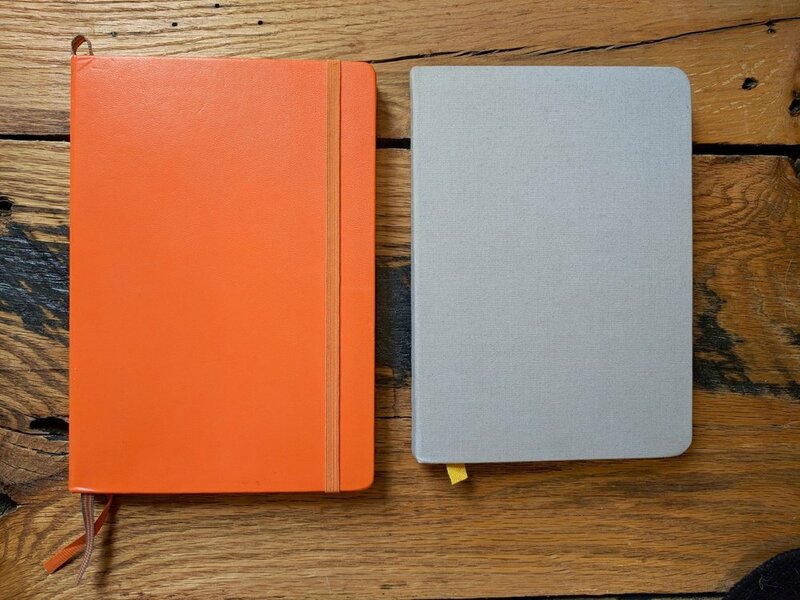 Sure, these notebooks are about as different as two notebooks could be, but the feeling they give is the same. The Leuchtturm1917 feels like it was made for me. It makes none of the sacrifices that Moleskines make, and it performs perfectly with my favorite fountain pens. I can see myself with a shelf full of these things in a few years, just as I had a shelf full of spy notebooks a few decades ago. The first few weeks of the school semester are always complete chaos. My calendar is filled to the brim with students, class prep, and meetings, and all of my favorite hobbies and normal healthy habits fall by the wayside. Despite the temporary insanity, this time always reminds me of which systems are tried and true, as well as which tools are vital to my survival. Instead of trying tons of notebooks and pens, it becomes a game of finding just how little I need to get the work done. Over the last year of experimenting, there are a few tools that I come back to over and over again. These are the tools that I turn to, when times get tough. Note, header links link to my reviews if available, and paragraph links may contain affiliate links. The Lamy 2000 remains my favorite pen in the arsenal. This is my goto notetaker, and the smooth nib makes writing anything a complete joy. I combine this bad boy with Pilot Iroshizuku Tsukushi ink. The ink's subtle shading properties and slight flex in the 2000's nib work together to produce beautiful shades of brown on the page. The 2000's piston filling system ensures that there's plenty of ink for long writing sessions, and the pen's sleek design makes it appropriate for formal and informal settings. My job involves dozens of resume reviews every semester. Although I do provide some feedback digitally, I mostly rely on analog tools to mark up student documents in one-on-one sessions. The TWSBI 580AL is my favorite pen for this task, due to its huge ink reservoir and consistent performance. I use Diamine Pumpkin, as a more interesting variation of a traditional red. The TWSBI's slightly wider nib and clear body bring out the best aspects of the bright orange Pumpkin ink. I've tried several pen storage options, but the Sinclair beats them all. The top zipper makes it easy to quickly grab a pen, and the three pen slots provide a great balance between capacity and size. I keep my TWSBI, Lamy 2000, and Retro 51 Tornado Slim on deck, and keep a Nock Co. DotDash Notebook, with some Nock Co. DotDash Index Cards in the notebook sleeve. My Sinclair lives in my messenger bag, but I can take it solo when I just need a few pens and a notebook. The only thing that would make this case better would be if it came in a Steel/Mango color way. Some of you may be wondering what ever happened to my Midori Traveler's Notebook. I love the Midori, but I find that I enjoy it most when I'm on the go and need a notebook that can hold a pen, business cards, and other goodies. It's great for trips, conferences, and events, but it's just a bit too much for my simple day-to-day needs, when I just want to write. I discovered the Leuchtturm notebook this year, and I'm in love. The dot pattern and fountain-pen-friendly paper work well for my needs. I enjoy the wider A5 sheet, compared to the slimmer Midori paper size. It also helps that the Leuchtturm comes in a brilliant shade of orange, which seems to be a favorite color among pen addicts, myself included. I picked this guy up during my visit to the Apple store on Apple's campus. It's only available at this location, but it's comparable to the standard slim models, which are widely available. I typically use fountain pens, but the Tornado is my favorite alternative, when a fountain pen just won't do. The refill is excellent and the pen's body is the same material as a standard MacBook. It's fun to experiment with new pens, stationary, and ink, but times of chaos ground me in what's truly necessary to get the job done. These times also provide an opportunity to clear out everything from my pen case to my laptop until I have just enough, just the bare minimum needed to do the work. This culling of the unnecessary provides focus and reminds me that its not about the tools, but rather about the work. When I'm rushed or cranking away, all of the extra stuff just gets in the way.